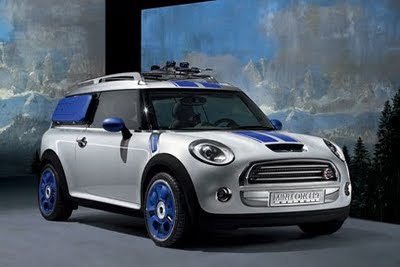 With all the snow that's been dumping on the good ol' SLC, I can't help but think about the MINI Traveller Concept that debuted just prior to the release of the Clubman at the 2006 Detroit Auto Show. That year, MINI showed up to the four major international auto shows with four different versions of the MINI Traveller Concept. Here you can spot the concepts for Geneva, Tokyo and Frankfurt. 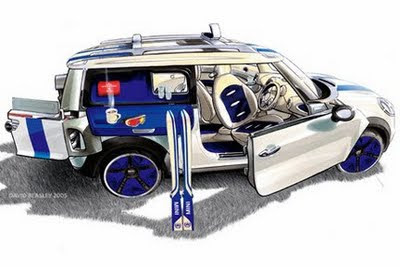 The version created specifically for North America, simply dubbed the MINI Concept Detroit, was decked out for winter with a custom MINI ski rack and boot box in the... uh, er... boot. And my favorite part, side-mounted counter space to whip up a mug of hot chocolate (the beverage, not the color). The first time I saw pics of this online, I was pretty stoked. It totally reminded me of a life-sized version of a random little Lego set I got for Christmas as a kid with a little skier dood and his ride. I mean this car makes me wish I actually skied. It's also cool to see how may features made it into the Clubman that's based on this very concept, such as the boot box. The Clubman has a similar covered storage area in the back. In fact it's where I hide all my Christmas presents for Mrs. Kyality. I know she'll never find them because: 1) she'll never look there and 2) she DEFINITELY does not read this blog. So they're safe and sound. For sure. Okay, so that last bit made me laugh out loud. My wife wouldn't ever read what I write either; she's afraid her eyes would glaze over from boredom or something to that effect.